History The Spanish Warmblood Breed was developed by Marji Armstrong at Yardah Stud from its Andalusian horses and purposeful crosses with quality Thoroughbred and Warmblood mares, followed by highly selective line breeding. The genetic pattern produces horses that, unique in comparison to any existing breed, combine substance & sensitivity, athleticism & fineness, excellent temperament & long term soundness of body and mind. Their mental balance, intelligence, will to work, and harmony of form give them an extraordinary capacity for collection. Yardah Stud has bred for exceptional athleticism in a size of horse that is healthy biomechanically for the equine species – 15 to 16.2 hh. They are ideal horses for classical training and Olympic disciplines at any level. Spanish Warmbloods are found in most colours, though grey, black, and bay are the most common. Owning a Spanish Warmblood, or breeding to one, is an exciting opportunity to enjoy and profit from this unique genetic group of animals, now a registered breed. The Spanish Warmblood stands at 15 to 16.2 hands and is a picture of grace and power. They have a fine, elegant head with well spaced and large eyes and well defined facial features. The Spanish Warmblood has a well arched and graceful neck that is set high on the withers. It ties into a deep, broad chest with a well sloped shoulder and a strong forearm. The range of motion of the shoulders is great- and important for jumping ability and Haute École movements. The large expressive step of the Spanish walk comes easily to these horses. Knees should be flat, strong, and seamlessly tied into the forearm and cannon bone. Substantial cannons flow into strong fetlock joints and medium length pasterns. The hooves are strong with a slightly convex wall profile. The limbs of the Spanish Warmblood are clean, strong, and well formed for work and soundness. CONFORMATION PHOTOS (SIDE, FRONT, BACK) The back of the Spanish Warmblood is wide and strong, allowing it to perform Haute École movements comfortably. They have a strong hindquarter, well angled hocks and strong stifles. They stand well under themselves and move with great thrust from behind. The Spanish Warmblood is built for exceptional collection and has a wonderful natural ability for piaffe, jumping, and Spanish walk. The Spanish Warmblood has strength, stamina, true paces with good rhythm, and elastic backs which produce powerful yet soft movement. The Spanish Warmblood has compact power, flexibility & good range of motion, balance and speed. They can lighten their front end to engage, jump and spin. The Spanish Warmblood is a generous, honest and successful in competition. 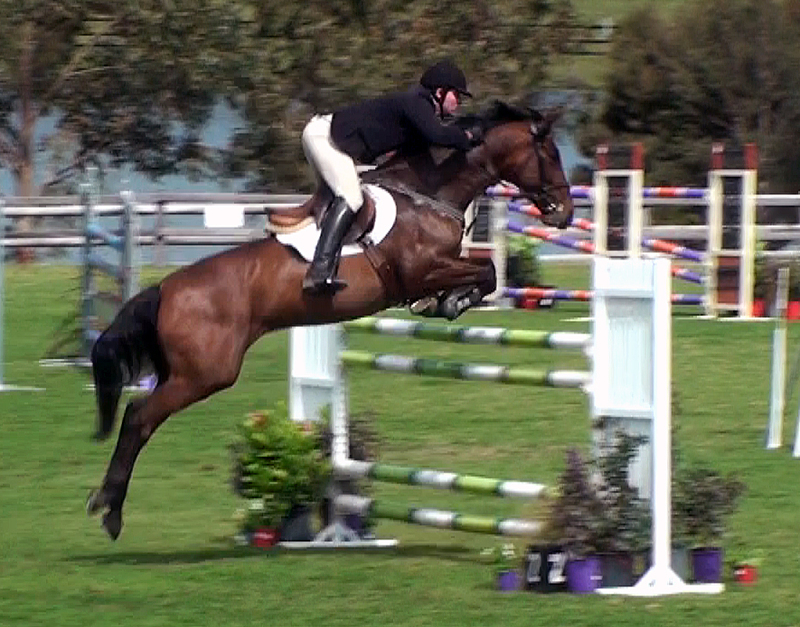 PHOTOS: JUMPING, DRESSAGE, LIBERTY (MATURE STALLION) SHOWING SUBSTANCE AND MOVEMENT. Temperament & Manageability The Spanish Warmblood has great natural presence, tremendous generosity and personality, all matched with manageability. Manageability is a breed characteristic that they must have, whether stallion, mare or gelding. From birth they must show willingness to engage with people. They can be handled by a variety of people with different levels of expertise. When in training they stay focused and learn easily. They are kind and affectionate workers with tremendous capacity to develop relationships with individual riders. While their presence makes them larger than life and they retain their spirit, they are compliant. PHOTOS: WORK ETHIC, ATTENTIVENESS, FOCUS The Ideal Modern Sporthorse Bred with solid talent for the Olympic disciplines, Spanish Warmbloods have the character, scope and athleticism to compliment the amateur and offer a rewarding partnership for the professional. They are a pleasure to handle in a variety of situations, and amenable to training. They are pleasant to ride and competitive because of their expressive movement and strong elastic backs, which they offer generously. How they naturally use their bodies enhances the rider’s effectiveness. These horses enable you to sit proud and look good. Riding these horses takes you to new heights: over fences, in the classical arts, or whatever the path of your experience. Let these horses pick you up and join you in the movement. Get a sense of deep satisfaction, and share the joy of achievement with a generous partner without compromise.